While I found this wonderful guide on how to set up macOS for PHP web development, what I want to have is the ability to run multiple php versions simultanteously on my host. As a bonus treat, valid https certificates for local development with mkcert. For the benefit of completeness I’m going to paste all setup from scratch. For the latter, always check the instructions on the official site of the project. If it returns some rows then you have to disable system provided apache. By default brew’s http listens on port 8080 (listed as alt-http on the ps command above), so you can check if it’s working by visiting http://localhost:8080 on your Mac. To ease up development we’re going to change some Apache config, basically to run as the logged in user and avoid permission problems. I use ~/work as my development area, so I’m going to set /Users/maxxer/work as my webserver root. Adjust the following commands to suit your environment, which basically is logged in username and project webroot. 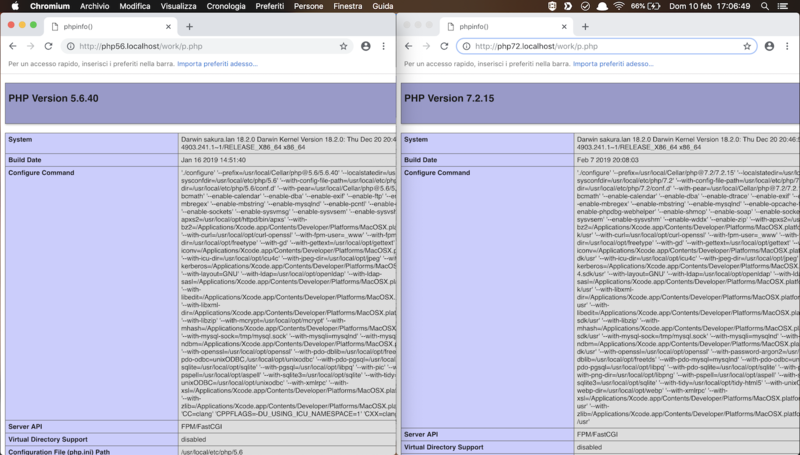 Note of Feb 10th 2019: there’s a bug in 5.6 tap which doesn’t create php-fpm.conf and php-fpm.d/www.conf. You can easily pick them from another directory and put them in /usr/local/etc/php/5.6. You just have to fix some lines for 5.6, but will work. The default port is 9000, I usually change the latest two digits to the version, in this case 9056. For /usr/local/etc/php/7.2/php-fpm.d/www.conf use 9072. Restart all the php@ services and that’s all, the PHP configuration is done. Let’s plug it into Apache. So the primary goal of this guide is tho setup our httpd to be able to serve multiple php versions simultaneously. We’ll accomplish this by adding multiple hostnames to our local server. I use php56.localhost and php72.localhost, but you can choose whatever you prefer. 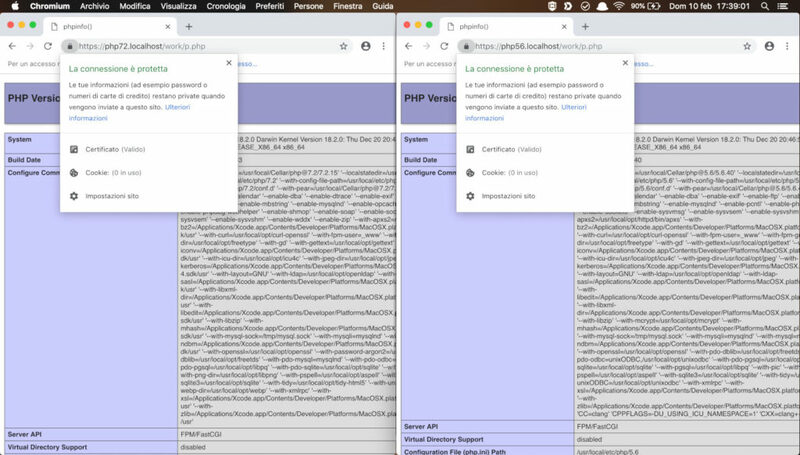 Test the configuration by creating a phpinfo.php file in the webroot and then open http://php72.localhost/phpinfo.php and http://php56.localhost/phpinfo.php, they should show the different PHP versions! We reached our first goal. Now a bonus treat: https! mkcert is a project which makes it really trivial to create a local certification authority (CA), deploy this cert into the local browser and then generate as many trusted local certificates as you want. That is adding SSLEngine, SSLCertificateKeyFile, SSLCertificateFile, changing the VirtualHost port and adding Listen directive (beware this one must be added only once in the file!). Be sure to match certificates with ServerName, then restart httpd and you’re done! Questa voce è stata pubblicata in english, macos, tech e contrassegnata con 10.14, httpd, https, macos, mkcert, mojave, php, php-fpm. Contrassegna il permalink.